I am working up some data and found that leaf angle is important to my results. 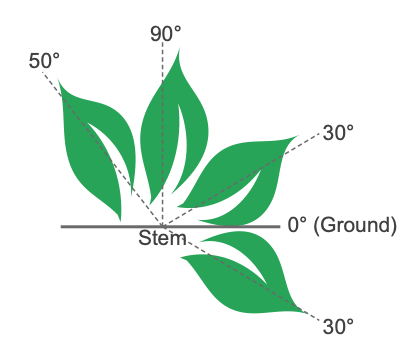 I read that the leaf angle was relative to the ground (https://photosynq.org/search/discussions/114), which means that a leaf parallel to the ground would have a leaf angle of 0. Correct? I am asking because my leaf angles range from 25-110. If the angles are using the ground as a reference, then my 110 degree leaves would be flipped over. Because my plants are wilting, I'm inclined to think that the angles are referenced differently such that a leaf parallel to the ground would be 90 degrees. Could someone please clarify this issue? Thank you! 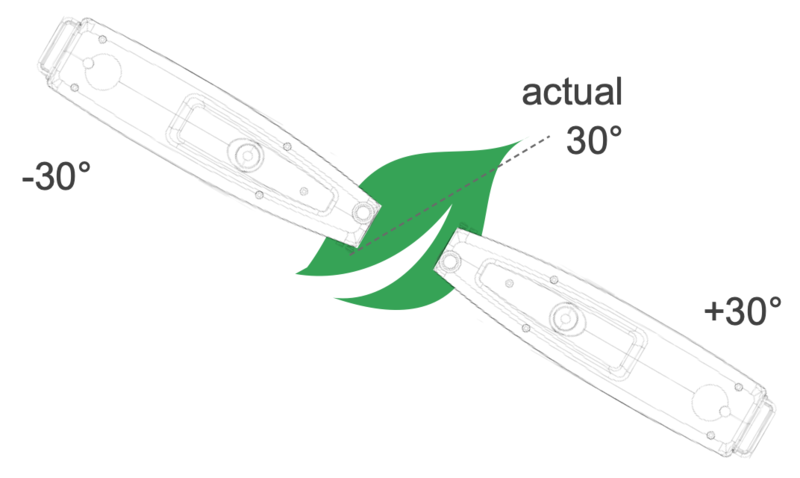 when the leaf is parallel to the ground, or in other words, the PAR sensor of the MultispeQ is pointing straight upwards to the sky, the measured angle is 0 degrees. A vertical leaf (leaf tip pointing upward or downward), would be 90 degrees. The maximum angle is 180 degrees, holding the MultispeQ upside down, or the PAR sensor pointing towards the ground. In contrast to pitch and roll the angle is always a positive value, regardless of the direction the MultispeQ is turned. Hi Sebastian! Thanks for the quick response! Were pitch and roll recently implemented? Or has that been around for a while? I ask because I can not find it in my datafile. This data was collected in July/August 2017 and used the RIDES131_2 protocol. Positive and negative angles are very important to distinguish! I am working in common bean, which has sharp hyponastic responses throughout the day. Specifically in the experiment I am looking at, +30 degrees may indicate heat stress, while -30 degrees may indicate wilting. So the same 30 degree measurement may indicate very different biological reactions! Thanks again for the discussion and any help you can offer! Pitch and roll are collected with every measurement, but the protocol that you are using is not returning it. I assume this is the protocol you are using. Please ask the creator to add those parameters if you need them. When it was updated, you can add view the data again. Answer the reprocessing question with yes and the parameters will be available. I understand, why you need the positive and negative angles, but there is a caveat to it. The angle then depends on which side of the leaf you are using the MultispeQ (see figure). So if you are not consistent with the way you are taking your measurements, you will end up with the wrong results. Hi Sebastian, Thanks for the information and discussion! I'll follow up on some of your points!